The season begins tomorrow night! Are you ready? We at least have our show figured out, which is nice...(I'll be starting a central show announcement thread in a bit). Yeah good luck to all the corps/directors. Star corps are starting off in different regional tours which is our tradition. All set for tomorrow night's kick-off. See ya on the road. Generated scores based on last season's championship week, pro-rated to the beginning of the season. I must apologize in advance: the start of the season is going to be a little rough. We are expecting a death in the family in the next week or so, and I may disappear for a stretch and have to catch up when I get back. Please do not be alarmed if there are a few days with no scores posted. Totally understandable Kevin. Our thoughts and prayers go out to your family. Holy moly, scores for the first shows of the season are up! Congratulations to our 1st place winners for the first night of the season. 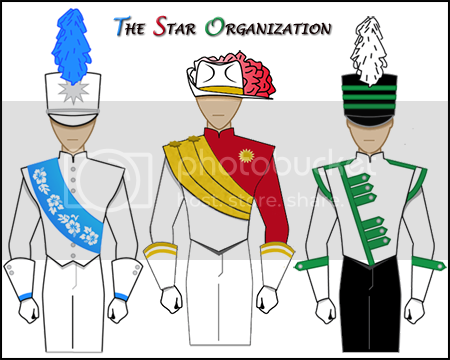 Our uniforms for this summer. Tradition continues. No drastic changes and NO SPANDEX! In 1st after two days of not competing? LOL OK.